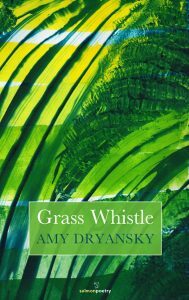 – Amy Dryansky’s newest poetry collection, Grass Whistle, was awarded the Massachusetts Book Award for poetry. While writing this collection, Dryansky began a blog about the intersection of mother/artist/poet in her own and in other women’s lives. 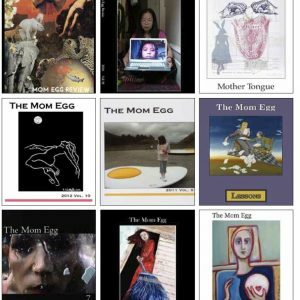 The blog establishes her mother/artist work as both important and interesting. The true gift of Grass Whistle is the proof that we can use whatever is at hand to make what we need. Every poem shines with transparent honesty about aspects of life and relationship we have been socialized to hide: “what I imagined spilled out, slopping/fake fairy dust over everyone/I couldn’t quite rub off”(17). As a mother, I love the simple truths that emerge, spill, climb out of her poems – the frank, the humorous, the hopeful—and above all, the wryly humble: “After so much careful looking, looking/and refusing to look,/you’d think I’d know plenty—/that snake in the grass—when I see it” (21). Dryansky does not shy away from the difficult: “…a summer thick with truncated choices—/who to hurt least, how to do it quickly, stop pretending/I had a plan” (24). 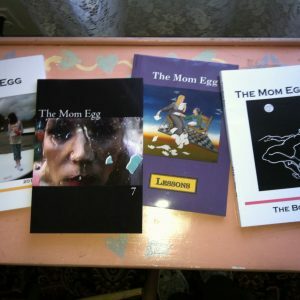 Two side by side poems voice in brief, poignant lines the full story of womanhood and motherhood: “Am I done with that?/…. I was certain/I felt the tide pull” (“This Paradise” 26). Then ‘She Continues’ sifts us through many meanings of the seen and unseen, life and death hanging in the balance of ‘not yet’; and yet, so much the fabric of each moment, thought, feeling. The reality of how mothers are called upon to anchor everyone, even when they themselves are floating. We, as she says, continue. No. Matter. What. In “Another Poem about Happiness” the lines “Seeing things as they are,/ she says, that is a kind of love…” (51) speak to the entire volume. For this collection is a gathering of authentic visions of love: for life, children, the planet, the spirit, experience, unknown, questions, acceptance . . . and ultimately, death. Dryansky makes a kind of balanced beauty of the unlikely. “Coyote Tree” weaves the tending of fruit with the tending of fruit’s predators in an eerily beautiful poem. This is followed by “the genetically altered versions of ourselves/which resemble us exactly and are like us/not a bit. (“Overimproved” 56). Such powerful juxtaposition! The rhythm of “Self-Portrait of Someone Who’s Not Me” moves us from one self to the next, pulling us deeper into the story like the dismantling of an artichoke—from tough exterior to the very tender heart; how loss changes us, in spite of our best intentions and attendant baggage. And finally, the title poem hands over layered and multiple interpretations. Poems do that. They elicit from us where we’ve been, what we yearn for…that sense of connection across time and space. This poem speaks to acceptance of what life throws our way, even if what life throws is not what we wanted…even if we feel responsible for holding everything together but sometimes simply cannot: “What I wanted was a rose, an open mouth./What I got was this slender blade of grass” (64). And consider what Dryansky has woven from that blade! Hope, humor, truth; compassion and connection with mother-readers; and a collection that invites (and deserves) multiple reading over time. Grass Whistle has simply too many layers to absorb all at once. An experienced writing coach, facilitator, change agent and mediator, Sarah W. Bartlett has, for two decades, midwifed the stories that evoke and celebrate voice among women. Whether battered women, cancer survivors, adolescent girls, or the incarcerated, each community practices the philosophy and intentionality of Women Writing VT. In January 2010, she co-founded writing inside VT, where truth-telling in a judgment–free setting encourages incarcerated women to reflect on and change life choices through writing.